The crew's next task was to put the entry monitor system (EMS) through a series of tests to verify that it could be trusted in its role, which was, as the name implied, to monitor the progress of the re-entry. This bit of kit on the main display console came into its own in the final minutes of the mission, but its weight wasn't carried for 2 weeks without it having to work for its passage. NASA's engineers saved weight by having systems share their components where possible, so throughout the flight, the accelerometer within the EMS provided backup to those in the guidance platform whenever the effect of engine burns had to be confirmed. Its digital display was regularly pressed into providing the crew with extra information, but the full capabilities of its systems were utilised on re-entry. 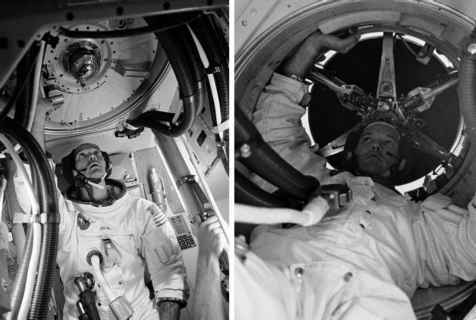 It was not a single display; it was rather a specialised guidance and display system to present critical entry parameters to the crew, and it occupied a prominent position on the spacecraft's massive instrument panel directly in front of the left couch. Normally it allowed them to monitor the progress of an automatic re-entry through its independent measurement of velocity and g-forces. But if the main guidance system were to fail (which happily never happened), it would have yielded enough information to allow them to steer the spacecraft manually to an accurate and safe landing. Among the switches and knobs on the EMS panel were three displays that covered various aspects of reentry. The largest was a window behind which was a scrolling graph on a long Mylar tape, 8.75 centimetres wide. A scribe drew a line across the tape showing the progress of the re-entry. The axes of this graph were deceleration and velocity: in other words, the rate at which velocity was being lost - the deceleration - was plotted against how much still had to be lost. As their velocity reduced, the scroll moved to the left, its scribe leaving a trace to enable the CMP to visualise the trends. If, during the early stages of re-entry, the onset of g-force was too rapid, then the spacecraft was coming in too steeply and needed to roll around and try to fly higher in order to avoid flying through the thicker air for any length of time. Conversely, a low g-force while still at a high velocity could mean that the spacecraft was failing to lose enough energy and would need to dive more deeply into the atmosphere or risk sailing out into space on a long lethal orbit. The scroll was drawn with lines that represented limits of g-force and the distance that could be achieved during the entry to aid interpretation. Below the scroll was a digital display that was discussed in earlier chapters owing to its use in previous stages of the flight. During re-entry, it displayed either the range in nautical miles to the splash point, or the current velocity. The initial values for both were entered into the EMS prior to re-entry. The third display, the roll stability indicator (RSI), looked a little like a simplified artificial horizon, which is quite a good description. It consisted of a pointer on a circular display that told the CMP the direction in which the spacecraft's lift vector was aimed with respect to the Earth below, and was driven by the GDC and its gyros. Since the lift vector was always in the direction of the crew's feet, it essentially indicated whether they were flying feet-down or feet-up. Two indicator lamps were located at the top and bottom of the display which told the CMP which way round the lift vector should be aimed, up or down, to achieve the correct re-entry conditions. If he needed to fly the re-entry manually, he would roll the spacecraft to aim the pointer at whichever lamp was lit. 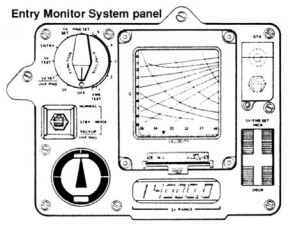 Diagram of the front panel of the EMS. built-in tests that verified the unit's correct operation. These tests ensured that the lamps would trigger at the correct point, that the digital counter was operating, and that the scroll and its scribe were working properly. Two different patterns were printed on the scroll: one for a conventional re-entry, the other for an entry that would skip back into space for a time. The start of the scroll included several patterns for testing the scroll, whereby the scribe was expected to make a predefined series of motions.